Thank you for considering Kicky Tours for a Study Tour for your school! I would like to take this opportunity to introduce ourselves to you. Kicky Tours is a small Study Tour company, it was founded in 2011 and is owned and run by myself, Robyn Catling. I have worked in this field for 15 years beginning with Edith Cowan University’s International English Centre until 2006, then for Milner International College of English until 2011. Our programs are high quality educational programs that combine English Language with tours of the major tourism attractions in and around the city of Perth. Personal attention is the highest priority at Kicky Tours, as is offering the best program for your students. 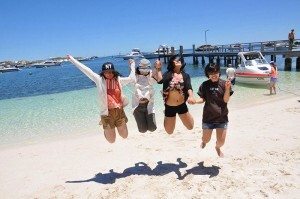 In 2012-13 Kicky Tours welcomed over 500 students to Perth for Study Tours in 4 locations from countries such as Hong Kong, Japan, Taiwan and Reunion Island. We specialise in arranging tours for high school age groups. Homestay accommodation is the most popular choice for student accommodation as it gives them the opportunity to live with a local family. Kicky Tours has an extensive host family pool providing high quality accommodation for students. All families are checked by our Homestay Placement Officer who is a dedicated staff member to deal with all facets of accommodation.